A few of you have asked for my Christmas Soap recipes. I’ve shared my Pumpkin Spice Recipe. Over the next few days I’ll share a few more Christmas Soap recipes. If you’re just buying for gifts, you can find these in my shop. 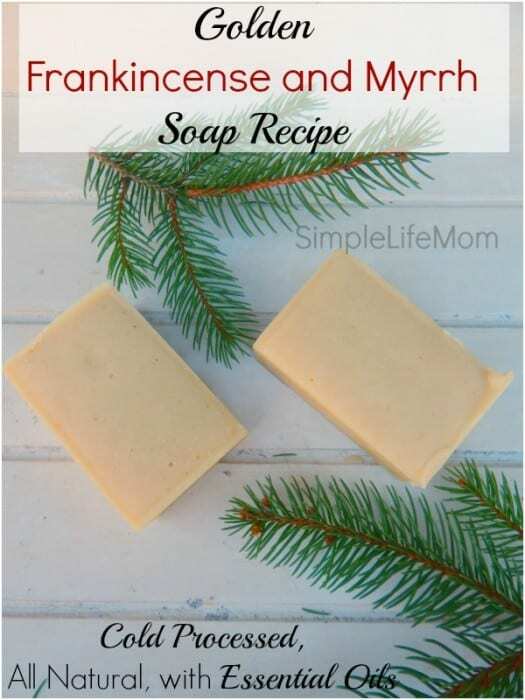 You may think these are coming out too early, but if you are going to make some soaps to use and give for the Holidays, you need to be making them NOW! So, here you go! A Golden Frankincense and Myrrh Soap Recipe. I have these available in my shop for the Holidays, as well as other holiday soaps and gifts. I wanted this soap to be slightly golden instead of just creamy in color. Obviously, it’s just more fun to call it Golden Frankincense and Myrrh!! That’s easy enough. There are a number of things that can be added to make a more golden color. I have a color guide I’ve put together for anyone wanting something different. Natural Additions to give you a yellow or golden color: turmeric, annato, ginger, and sometimes a bit of paprika to make it a bit richer in color. These don’t add a physical texture or spiciness to the soap. Paprika can give it small speckles, depending on how it is mixed, cured, and the size of the paprika particles. For this soap I’d suggest using turmeric with a small amount of paprika. I tried just turmeric the first time and it was a lovely “nacho cheese” color before it cured, so my daughter said. After curing it had only a slightly more golden color than my usual recipe. This is why I like to combine it with a little paprika to enrich the color. Or Add milk! Milk (cow or goat) will naturally give your soap a more golden color. Substitute a small amount of your water with milk and add your lye SLOWLY. Honestly, Myrrh stinks. I’m sure there are people who love it, but I’m not one of them. I don’t hate it, but it’s not something I’d like to smell all day. Frankincense on the other hand is a scent I just can’t get enough of. Yet, I know it’s not the favorite of everyone either. Everyone’s different. They both have a woody scent. After all, they both are tree saps. When you buy a good Myrrh essential oil it will be super thick. I actually dilute it 50% in a carrier oil and shake it like crazy before each use. I’ll then double whatever I put in a recipe so I get the correct amount. If you don’t, it will never come out of your dropper! To make this into an AMAZING smelling soap, still getting the medicinal and “Christmasy” qualities you want, add another oil such as Orange, Lavender, Patchouli, Rose, Rosewood, or Sandalwood essential oil. I chose orange essential oil and it blended beautifully! 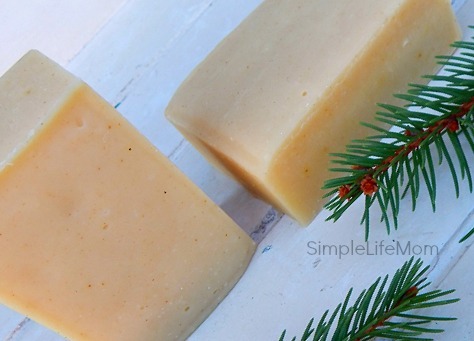 A wonderful Christmas time (or any time) soap recipe. Weigh and combine tallow, olive oil coconut oil, and cocoa butter in a large stainless steel pot. Melt and cool fats to 95-100 degrees F.
Weigh water and lye. Add lye to water (not the other way around) OUTSIDE, being careful not to breathe in fumes. Cool to 95-100 degrees F.
Add lye water to fats and stir with hand mixer on and off until light trace. Remove a cups worth of soap and add turmeric and paprika. Combine until there are no clumps and add soap back into batch, mixing well (or wait and swirl it in after you pour your batch into your mold). What other soaps would you like to see? Any questions? Please leave a comment below! Very interesting. I don’t think I have ever made soap before. What do you do with this type of scented soap? Give it as gifts? Yes, we give it as gifts. The plus side is the natural ingredients. It’s much more healthy for your body, and a lot of people who have had skin problems in the past cure up right away just by switching to natural soap. I’ve always wanted to try making my own soap, and I imagine picking your own scents and oils would make for the best soap, if done correctly. I may have to learn to do so, homemade soap would make a great gift for the holidays! Thank you for sharing your post at Our SImple Homestead Hop! Christine! I’m so happy that you have found relief! How wonderful!! Thank you for sharing. It’s so good to hear encouraging stories like this! Hi, i always prefer the least amount of processing as possible, that means I don’t buy deodorized. That cocoa smell is great anyway! I have both in my shop. https://www.etsy.com/shop/simplelifemom You can always substitute a different essential oil in a recipe. A 1oz e.o. to 3lb soap ratio usually works well. Hi! I was wondering if you have a tallow alternative? I’m new to your blog, so if you have this posted elsewhere, I apologize in advance. Thanks for all of the wonderful recipes! You can use lard probably without any changes, but run it through a lye calculator to be safe (like on soapcalc.net). You can also use other recipes and just add the extras from this one. Use the menu tab at the top of the page for Handmade Soap and find lots of recipes there. Hi was wondering where you purchase your lye? Can I substitute another oil for tallow ? Have you made any lilac or any other flower soap ? Please be sure and post if you ever do ! You can always change which essential oils you add to a recipe. You can use this recipe with floral scents if that’s what you prefer. You cannot change the base oils however. The recipe will not work the same.